You’ve probably noticed there’s a rail on the front of your pistol, and despite what many people think, it’s not there for impressing the ladies. No, not even those in Texas. It’s actually for mounting accessories, tactical flashlights, to be specific. 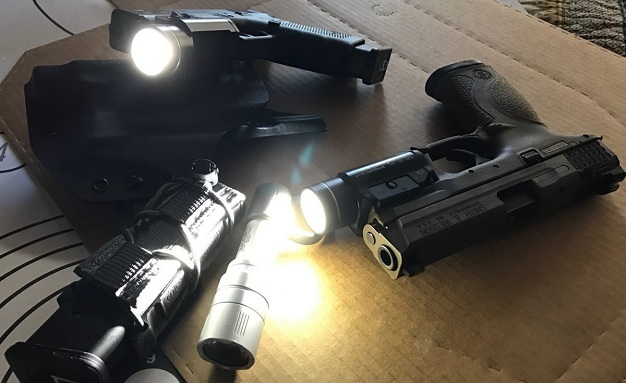 Anyone who uses a gun as part of their job should also have a quality flashlight, and rail-mounted flashlights are usually the most popular and convenient solution. Some people prefer hand-held flashlights, and that’s fine too, as long as you’re comfortable with holding it for extended time periods. But no matter which option you prefer, it’s of utmost importance that the light you choose is of high-quality. But what defines a quality flashlight? Well, generally, that would mean that the flashlight should have LED technology, as it’s the most advanced one available nowadays. It should be well constructed, durable and it should be easily activated with one hand. Typically, the switch is located on the back of the flashlight so that you can conveniently flip it with your thumb. A quality mounted pistol flashlight should be even more durable than its handheld counterpart, because it will have to withstand the recoil of the gun. The lens should also be capable of enduring the fouling and muzzle blast without diminishing the quality of the beam or completely breaking. That being said, a quality mounted pistol flashlight doesn’t come cheap. Regardless of your choice, you need to consider the brightness of the pistol flashlight. There’s a lot of discussion and claims that the brighter – the better, which can’t be further than the truth. No matter how bright the illumination is, you should expect aggressors to curl up and cry just because you’ve “blinded” them with a ton of light. While it may de-escalate for a moment, too much brightness won’t force a person that’s trying to hurt you throw the towel and give up. In fact, too much light can compromise your own visibility. A flashlight with 200-500 lumens is great, anything beyond that is pretty much overkill. Most tactical flashlights use CR123 or AA batteries, both of which are affordable. Bright illuminating flashlights burn through the batteries quicker, which brings me back to my point – brighter is not always better. Bottom line is, look for a flashlight from a reputable manufacturer who has a history of making quality pistol flashlights that are reliable and durable. There’s no shortage of such flashlights on the market, so you shouldn’t have a hard time picking a decent one.